This lantern is a strong, durable and versatile LED lantern that's perfect for camping, workshops or outbuildings without electricity, an emergency light for your vehicle and the perfect light for your home or cabin in case of a power failure. 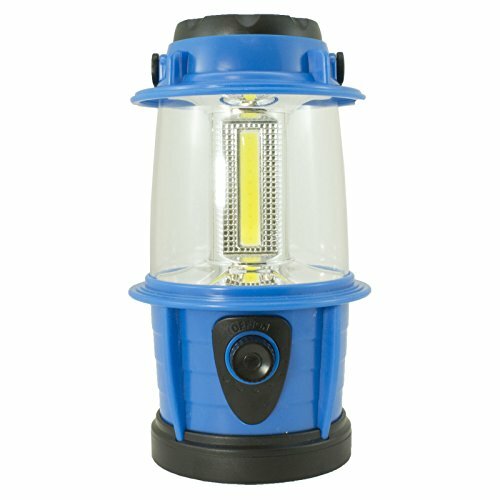 The lantern features up to 225 lumens of brightness with a Dimmer to adjust the level of brightness needed. It's the perfect COB LED lantern for family fun, outdoor enthusiasts, preppers, campers and more. Order your Promier 225 Lumen Camping lantern Today!!! Special Note to Buyers: ANY PRODUCT PURCHASED FROM APOLLO'S PRODUCTS THAT IS FROM PROMIER PRODUCTS HAS A 100% GUARANTEE ON IT. IF YOU HAVE ANY PROBLEMS LIKE A DEFECTIVE UNIT, YOU DO NOT HAVE TO RETURN IT TO AMAZON. JUST CONTACTED APOLLO'S PRODUCTS AND I WILL GIVE YOU PHONE NUMBER TO THE SALES MANAGER OF PROMIER PRODUCTS AND THEY WILL SEND YOU OUT A REPLACEMENT NO QUESTIONS ASKED. NOTE: I WILL ASK YOU TO REPLACE THE BATTERIES 1ST TO SEE IF THAT IS THE PROBLEM. Promier website information is located on the package. Otherwise I will assist you in a replacement Thank you Apollo's Products. Built in carrying handle and 3 AA Batteries (Included) Uses Std AA Batteries. ANY PRODUCT PURCHASED FROM APOLLO'S PRODUCTS THAT IS FROM PROMIER PRODUCTS HAS A 100% GUARANTEE ON IT. IF YOU HAVE ANY PROBLEMS LIKE A DEFECTIVE UNIT, YOU DO NOT HAVE TO RETURN IT TO AMAZON. JUST CONTACTED APOLLO'S PRODUCTS AND I WILL GIVE YOU PHONE NUMBER TO THE SALES MANAGER OF PROMIER PRODUCTS AND THEY WILL SEND YOU OUT A REPLACEMENT NO QUESTIONS ASKED. NOTE: I WILL ASK YOU TO REPLACE THE BATTERIES 1st. If you have any questions about this product by Apollo's Products, contact us by completing and submitting the form below. If you are looking for a specif part number, please include it with your message.